As I wrote in my earlier post, we were lucky enough to spend our 4 day Easter Weekend on an amazing trip to Cairo, Egypt. I already wrote about some of the questions I was asked most often in the prior post (especially on the safety topic). So now that thats out of the way, back to our vacation in Cairo! We arrived on Friday at 3am (ugh) and got picked up by Emo tours to take us to our hotel. During the drive (after they taught us important Egyptian words) we decided to book a tour for Friday to see the Egyptian museum & the Citadel. Just to show how flexible this company was, we booked a tour at 3am for that same morning! After a few hours of sleep, we were on our way to the Egyptian Museum with Ahmed and the driver. 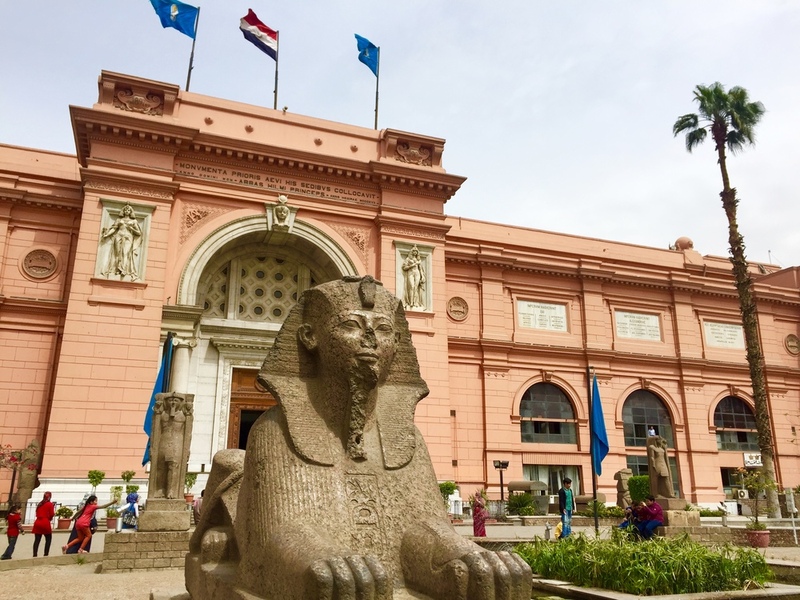 The Egyptian Museum of Antiquities has some of the most important pieces of ancient Egyptian history. Artifacts dating back to 1550 BC! One of the most amazing things about this museum, is you can touch most things on display! Literally, I touched an artifact that was from 1400 BC. unbelievable. After the Egyptian Museum we visited the Cairo Citadel which is a medieval Islamic fortification. We first went to the Mosque of Muhammad Ali which is a gorgeous and huge mosque. We learned that in the muslim religion, before entering the mosque you must take your shoes off. The view from the Cairo Citadel was absolutely gorgeous, and it made you realize how massive this city is. Next up on our tour for the day was a walk through Old Cairo. Old Cairo is home to Cairo's Coptic Christian Community. The Coptic Orthodox Church traces its founding to Saint Mark the Apostle in 42 AD, and it arguably the world's oldest Christian denomination. Here is a video of us just walking through the streets making our way to one of the mosques. And to end our amazing day of touring Cairo, we sat down with Ahmed our tour guide for some Egyptian shisha and lemon tea. By the end of the day we were exhausted! We had learned so much, and experienced things we never imagined... and we were SO excited for the next day of riding camels around the pyramids!